Tak Matsumoto on guitar and Koshi Inaba on vocals make up the base of what is arguably the absolute number 1 Japanese rock band, B’z. B’z was created back in 1988 but what is it that makes them so successful? Is it Tak’s skillfully executed riffs? After all, he is a Gibson Signature Artist and that honor is reserved for very few artists in the entire world. Or, is it the emotional lyrics about all facets of human interaction (friendship, love, etc) brought alive by Koshi’s distinctive voice? It’s a mix of both and throughout many years and style changes, B’z have always stayed the same. Musically they’re not easy to categorize. In their early years, they had somewhat of a pop sound. Both members, though Tak especially, have been influenced by rock legends such as Aerosmith, Van Halen and Led Zeppelin. 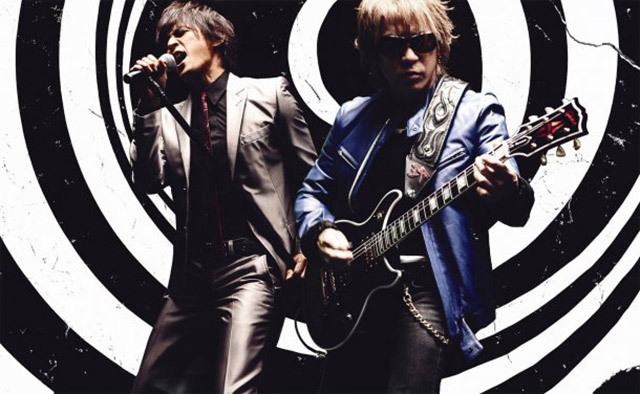 B’z has traveled through all possible styles of rock, from pop-rock at the beginning to blues rock and heavy guitar riffs with less keyboard work. In other words, B’z offers music for (almost) every taste. During the past years, the duo was supported by many national and International artists like Billy Sheehan, who already played with International rock stars like Mr. Big, David Lee Roth and Steve Vai among others.